I stared at the picture on my phone, wondering if I was seeing what I thought I was seeing: Was that Max standing on the walkway of the Brooklyn Bridge? Dave had just texted it to me. He and Max had gone off on one of their adventures in New York City this weekend. "Did he actually walk across the bridge?" I wrote back. "The whole bridge," Dave reported. And now, they were eating pizza at Grimaldi's in Brooklyn. I couldn't think of a more perfect way to celebrate Max's 14th birthday this Saturday, and all the steps forward he has taken. Oh, yes, fourteen. Trust me, I can't believe it, either. I still think he's plenty cute, but he is growing up fast. I immediately Googled to see how long the walkway is. Dave and I had walked it years ago, after 9/11, when we felt compelled to do something that was a classic New York activity. Wow: 1.1 miles, and Max had made it. His leg muscles get fatigued faster than other teens' do because he has to work harder to use them. Once again, I thought: If only those NICU doctors could see him now. I also thought: If only I could have known in 2002 that the baby lying unconscious in the incubator would someday be able to walk the span of a bridge. I had never even heard of a baby having a stroke. 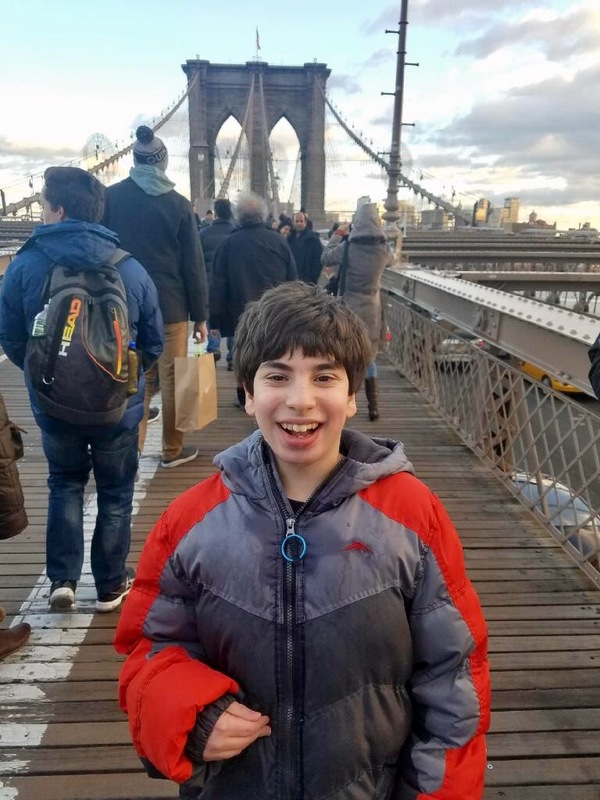 The list of everything that could be wrong with Max—not walking, not talking, cognitive impairment, speech and hearing issues—left me little hope for his future. It wasn't until I first saw him smile, at three months old, that I felt a glimmer of it. The hope would build, even as Max lagged behind in milestones, once I found a great team of therapists for him, understood the importance of inchstones, re-envisioned what it meant to have a child with disabilities, and basked in the warmth of Max's personality. He was sunny from the start. I thought, after Max's birth, that his life and mine were ruined. And now, this is my Max: a boy who loves roaming around the big city with his dad, exploring and eating lots of crappy food. A boy whose dad truly enjoys his company. A boy who is game to walk across an entire bridge. A boy who, like any of us, has his strengths and weaknesses. Walking: strength. Talking and using his hands: not so much, but improving. I gazed at the photo on my phone, and felt an intense mix of relief and happiness—feelings I could never have imagined having fourteen years ago. And I felt lucky, so lucky. This post made me sniffly. I know....such a shocker! And really, it made me sniffly for you, for Max, and also for myself and Jamie. It brings me back to when we planned a week in NYC as a late celebration of Jamie's 10th birthday. Jamie, who at a few days old one of the specialists told us not to get attached to, because we could not expect that child to survive. And he was TEN FREAKING YEARS OLD! And, much as that photo on the bridge represented so much to you, that first (and thus far, last) trip to NYC with Jamie was full of such moments for us. There was no aspect of it which we could have imagined him being able to handle -- let alone rocking, the way he did -- even a few years before. Here's to our boys....explorers of their own lives and the world around them! I love your posts. This one especially made me smile. So happy for you and for Max. His smile lights up a room. So maybe I shouldn't ask this. But I have a question for you. See, I don't work NICU anymore. And when I did, I was a pediatric resident, not a neonatologist or neurologist in charge. But I did sometimes have the job of talking to families about diagnoses and tests and what they all mean. And I often have the job now of explaining what an intellectual disability, or autism, or ADHD, or even occasionally CP, actually mean for the future of a quite young child. And I'm wondering how you would have felt, either 14 years ago at the time, or over the subsequent 14 years, about what I probably would have said. "So when babies have strokes, it can be very scary for everyone. And there are important things to think about right now, about seizures, and eating and so on. And everyone wants to know about the future, will he walk? will he talk? And the answer is, we just don't know. Some babies have strokes that cause a lot of damage in the brain, and they have significant problems moving and talking and learning, throughout their life. And some babies may have delays and problems in the beginning but then are able to build strength as they grow and develop, and don't have significant problems when they are older. And in most cases, the truth is somewhere in between, where most people have some challenges, with motor skills, and with learning, but are still able to grow and develop. And people in all the categories, even the ones with the most significant disabilities, can live happy lives. The thing is, no one can know, looking at a newborn, or looking at an MRI, who is going to fall into which category. We can't say "he'll never" and we also can't say "oh don't worry, he'll not have any problems." All we can do is watch over time, and work with you, and meet challenges as they come, and as he grows we'll have a much better sense of what challenges are there and what the best strategies will be to approach them, so he can grow into the best Max he can be." Tears. I can only dream of this for our daughter. What a special moment! Life is not about what you have, but what you do with it.